Near the tenth mile from Virajpet is the traditional Ainmane homestead of the Meriyanda extended family. This is the ancestral house of the former minister M C Nanaiah and of the owners of the law firm Poovayya and Poovayya who also own a popular resort elsewhere, which bears the same Meriyanda name. Some distance away from this residence is another homestay resort run by one Meriyanda Somaiah. The sword of Diwan Medu, who was an ancestor of this clan, was kept in this homestay. Also, a place formerly known as the Meriyanda Angadi (store) is located nearby. It is reported that several generations ago an unmarried lady, addressed only as Balliavva ('Elder Mother'), brought up her brother and sister-in-law's children. The descendants of the boys among them are part of the Meriyanda clan today. Balliavva had a place of worship known as the Mandana Murthy stana set up in the family farm. According to Gappu Ganapathy, a member of the Meriyanda clan, one historical family member who was called Maanichcha Moli (master), had two wives (probably his first wife died and then he married a second time) and six sons. The eldest among the boys was Meriyanda Medappa, affectionately called Medu, whose mother was from the Marichanda family. Four of his five younger brothers were known as Chettichcha, Kunjappa, Aiyappa and Ponnappa. Medappa, who was a government official, was made a Diwan under Linga Rajendra, the Raja of Kodagu between the years 1811 and 1820. It is said that Medu was a Diwan only for eighteen days. During a particular battle when Medu was stationed at the Nalnad palace, he sent his brother Chettichcha to the western border of the Kodagu kingdom. In the mean time Medu's rival had rumours reported to the Raja that Medu had sent his brother to the enemies in order to sell them official secrets. As a result a Panya (government farm), supposedly in Murnad and sanctioned to Medu's family, was immediately cancelled by the king. Medu was then charged with treason and made to run around the palace. The intention was to make him run into the king's Oidekatthi, a traditional sword also known as the Ayudha Katthi, which was positioned in the courtyard in a manner that it would slit open the runner's neck. But Medu ducked while he ran into the sword and so instead only his scalp was cut off. This then made him fall unconscious and he was taken out of the courtyard. Assuming that he was fatally wounded and hence would succumb to his injury, the palace servants reported to the Raja that Medu was dead. Meanwhile Chettichcha won the battle and the news made the Raja regret his decision. However, in the meantime, Medu was rehabilitated by a toddy drawer who applied medicinal herbs upon his head. It was only when Medu recovered, after some days, and returned to the palace that the Raja discovered that the Diwan had indeed survived. Diwan Medu was then honoured with the Raja's Oidekatthi bearing the small, embossed, golden 'Lin' seal of the Raja stamped upon it. This sword, made peculiar by the rare stamp, originally had an ivory hilt but ever since it broke it has been replaced by a wooden handle. The most commonly found seals of the Kodagu Rajas bear either of the Kannada syllables 'Vi' or 'Lin'. While 'Lin' belonged to Linga Rajendra, the 'Vi' belonged to his elder brother and predecessor Dodda Vira Rajendra. A number of Oidekatthis, bearing such seals had been presented by the respective Rajas in the past, but very few of them have actually survived. Three paintings of Diwan Medu and the Kodagu Raja were commissioned in the early nineteenth century. 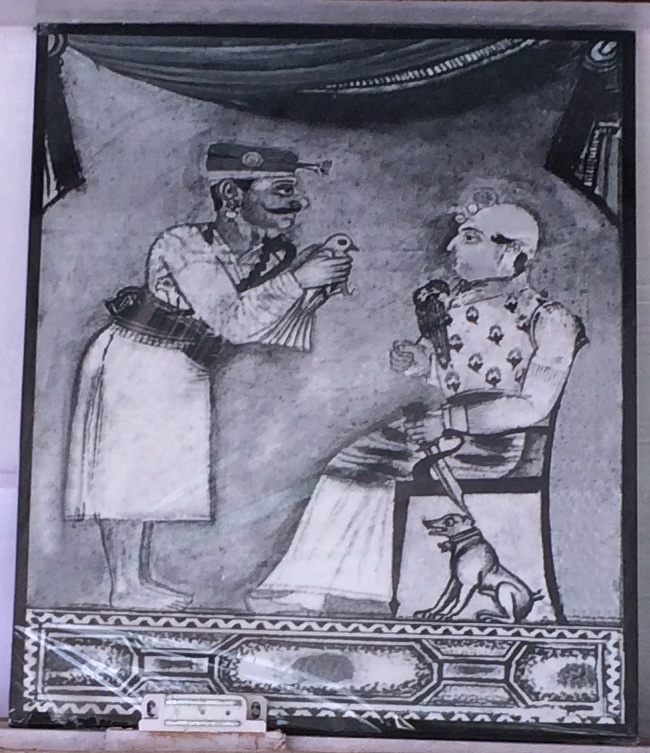 While the recipient (Diwan Medu) looks the same, the Raja appears to be different in each of the paintings. We can speculate that Linga Rajendra himself adopted different styles as he aged, unless the patrons were actually different Rajas, probably Dodda Vira Rajendra (r.1789-1809), Linga Rajendra and the latter's son and successor Chikka Vira Rajendra (r.1820-1834), under whom he would have served as an official and advisor. In these paintings Medu wears a red cloth head-dress, which has projections in front, and a thin 'kombu mishe' handlebar moustache, kept by the accomplished brave men of those times. He wears ear rings and is dressed in a white coloured Kuppya (a traditional long sleeved tunic) with an ornate knife, called the piche katthi, secured in his chele waistband. In the second painting he holds out a bird to the Raja, probably offering it as a gift. In the third he holds a bow and some arrows. Even the Rajas seem not to be spared by rules of propriety; in this case they had to have something held in their right hands when seen in public. They are either holding hunting falcons or holding what appears to be some sort of a flower or a jewel in their right hands. The Raja is seated in a chair placed upon a platform on which Medu also stands. This platform is covered from above by a canopy. 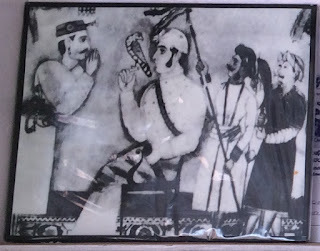 In the first painting the Raja is seen sporting large side burns upon an otherwise clean shaven face, long before Elvis Presley would popularise this facial hair style. Two turbaned and moustached attendants stand behind the Raja. One seems to be a flag bearer while the other holds up an Oidekatthi. 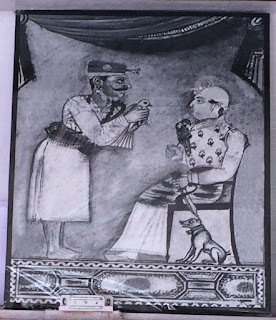 In the second painting the Raja is clean shaven and has a leashed dog beside him. In both the paintings the Raja wears light coloured head dresses and floral tunics. In the third artwork the Raja dons a cocked hat and has a moustache similar to what Medu has. The Raja also wears a dark, close-collared coat and what seems to be a beaded or pearl necklace. Two attendants stand behind him, one of them holding an upright Oidekatthi. While the original paintings have been kept elsewhere for safekeeping and preservation, black and white copies have been put up for display in the ancestral house. A spear of the olden days, known as a Barchi, has also been kept there. Family heirlooms, such as these paintings and swords, which are part of a heritage, are to be preserved for posterity. A number of similar beautiful paintings had been commissioned by the Kodagu Rajas, especially between 1792 and 1834, and given to different families across Kodagu. It is however unfortunate that we are not aware of the identity of the artists who drew them. 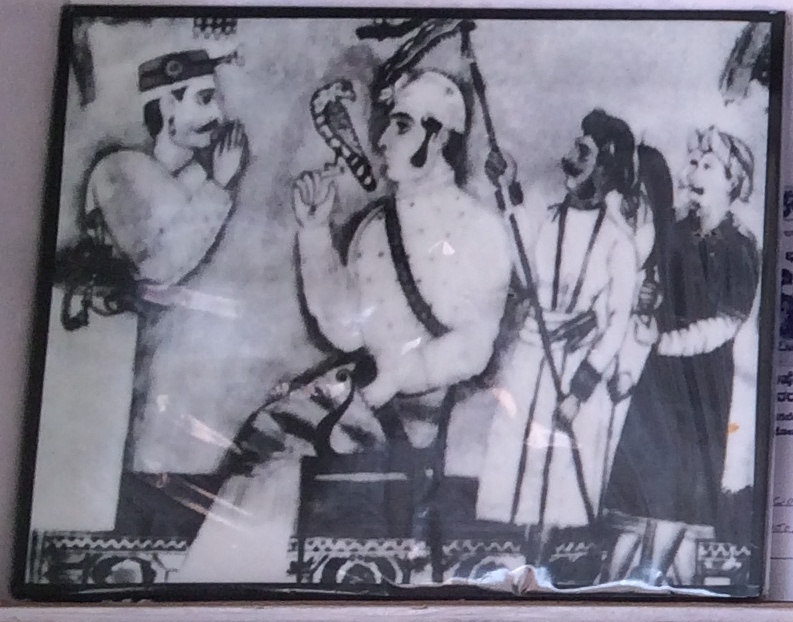 These paintings give us an impression of how the Rajas and how their officials and attendants appeared. Likewise, the Ayuda Katthis issued by the Rajas bear their respective syllabic regal insignia. 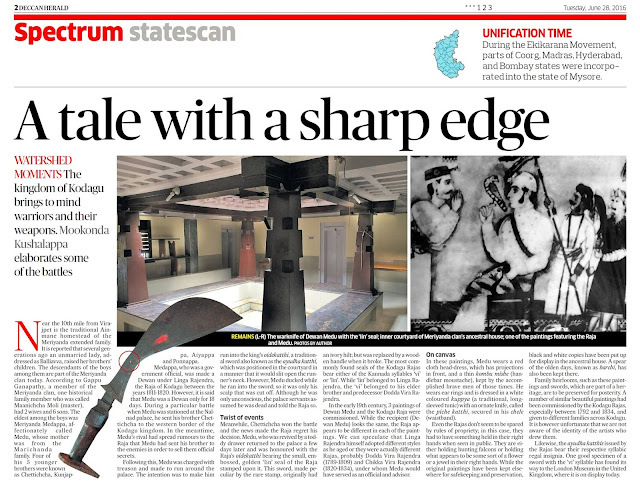 One good specimen of a sword with the 'Vi' syllable has found its way to the London Museum in the United Kingdom, where it is on display today.